I don't say this often, but this Revolight Bicycle Lighting System is one super cool new invention that could easily change the entire Bicycle Safety Market. The more videos I watch how the Revolight has evolved over the past few years, the more I'm convinced we will all soon be seeing bicyclist riding at night with this unmistakable and very unique safety lighting system. Kent Frankovich, the original inventor of Revolights, did a TED Talk in Sacramento, California last September where he talked about Kickstarting a Bicycle Safety Revolution. Unlike every other lights designed for bicycles on the market mounted to the handlebars, the Revolight's light shines in front of, and around your tires 360 degrees in all directions. There's been several new products on the Shark Tank that first started out as a Crowd Funding project, and only a handful with two successful campaigns under their belt. To my knowledge no Shark Tank Contestant has successfully raised capital via the Crowd Funding route, and in particular from Kickstarter, three successful times in a row. Having already raised over $300,000.00 from supporters, Kent has wisely timed the third Kickstarter campaign to coincide with his appearance on the Shark Tank Show. The fist Kickstarter campaign for Revolight ended September of 2011 that successfully raised over $215,000.00 from 1440 backers. The video describing this new Safety Light System for Bikes is worth watching if you "really" want to see how far the original design has evolved since then. The second round of Crowd Funding for Revolight was successfully completed for almost another $100,000.00 ending May of 2013. This is where they introduced the second generation of the Revolight System along with a limited edition bike design by the Mission Bicycle Company. Now in the midst of appearing on the Shark Tank Show, Revolight's is in the middle of their most ambitious Kickstarter funding project raising a minimum of another $100,000.00. With 47 more days remaining as of this writing, and over $25,000.00 already pledged, I would imagine after 7 million Shark Tank Fans see this very cool LED lighting system for bikes, the remainder $75,000.00 will be pledged in record time. As far as I can remember, there's only been one product seen on the Shark Tank that made a deal with Lori Greiner, and coincided another round of financing via the crowd funding route immediately after the Show. On the other hand I can easily think of a half a dozen products that didn't make a deal with the Sharks, but wisely had a Crowd Funding Campaign all set up and ready to take maximum advantage after their appearance on the Show. Another tall-tale that Revolight's founder Kent Frankovich, might not get a deal on the Shark Tank is he hasn't mentioned it on any of the social network sites. Now why would you not want to tell the world your product is going to be on the Best Business Reality Show in History? According to the previews for this Episode 521, it looks like Mark Cuban doesn't quite agree with some part of the presentation, and maybe that's why. Possibly an over inflated valuation for this really cool product that does have a lot of potential in the future, but not quite there yet? 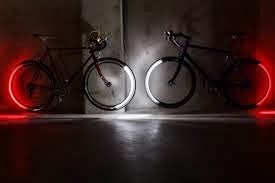 Either way, deal or no deal, the Revolight's is just too dam cool of an invention that really could revolutionize lighting systems for bikes, and do it in a stylish way. I look forward to doing an update on this invention after Kent raises another $75k on Kickstarter.com that's currently running. and be the first to get the "New Arc"
This is such a cool product! They completely deserved their deal. Also, I love that they had a Shark Tank special contest on Twitter while the episode was airing. Brilliant. So the controversy on the show was Cuban's claim that there was no real interest in an investment, but just to gain exposure. Robert made a deal on the show, and the question now is whether that deal actually materialized. Robert made a great offer, can we find out what happened?